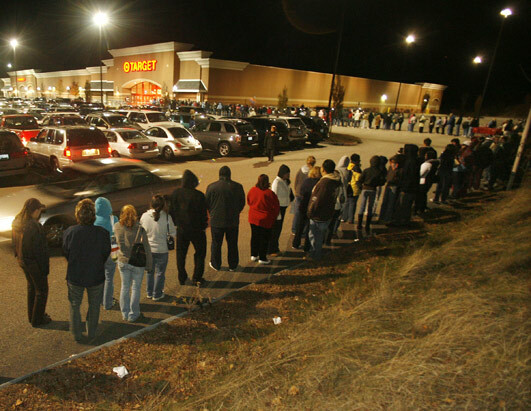 It has become an annual ritual; people encamped at retail establishments in the dark hours of the early morning, waiting for stores to open the day after Thanksgiving so they can stampede the aisles looking for deals. Some find this tradition a disturbing example of gross materialism. I don’t see it that way. I view it as a symptom of just how horrendously the economy is affecting us. Washington Post staff writers, Ylan Q. Mui, Dana A. Hedgpeth and Debbi Wilgoren present some pretty poignant reporting on what’s really going on out there. And hats off to them because getting the Black Friday reporting assignment is usually one of the silliest and predictable stories ever. These are anecdotes. Here’s the scope: the National Retail Federation says 134 million people are likely to have gone out shopping by this Sunday. In previous healthier years you might make the argument this is just the beginning of the Christmas buying frenzy. In this holiday season, I’d make the case that the hunt for the deal is not just about purchasing gifts. They’re out there looking to take care of their families. The desperation shown by businesses that would lead them to offer 30 and 40% discounts is matched only by the anxiety people are feeling that the economic foundation is crumbling beneath their feet. Does this sound like gross materialism to you? It sounds like survival mode to me.